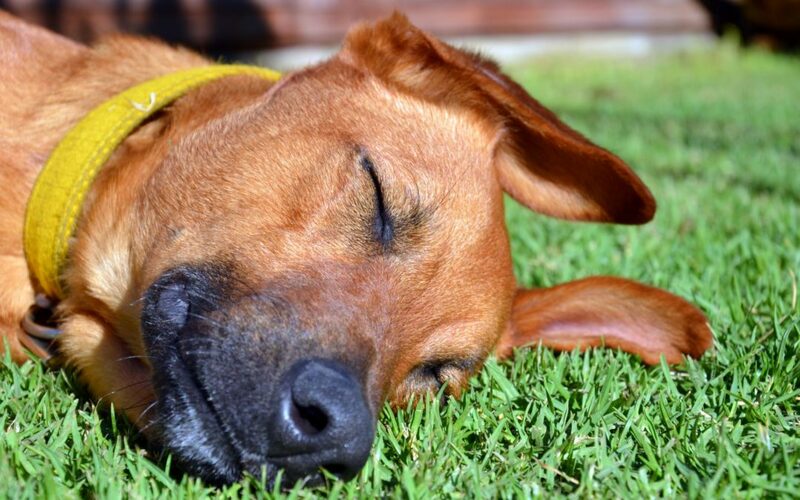 It's no secret, artificial grass is increasingly becoming very popular among homeowners looking for pet friendly alternatives to their traditional lawns. However, it's not as easy as choosing the cheapest product to install. Sure, you could do that, but it would be a mistake. There are many factors to consider when choosing the best artificial grass for your pet. Keep reading for all the details. This should be top of mind when thinking of which artificial grass products best suits your pet. Of course, dogs love artificial grass regardless, but to make it an equally pleasant experience for owners you need to think about drainage. 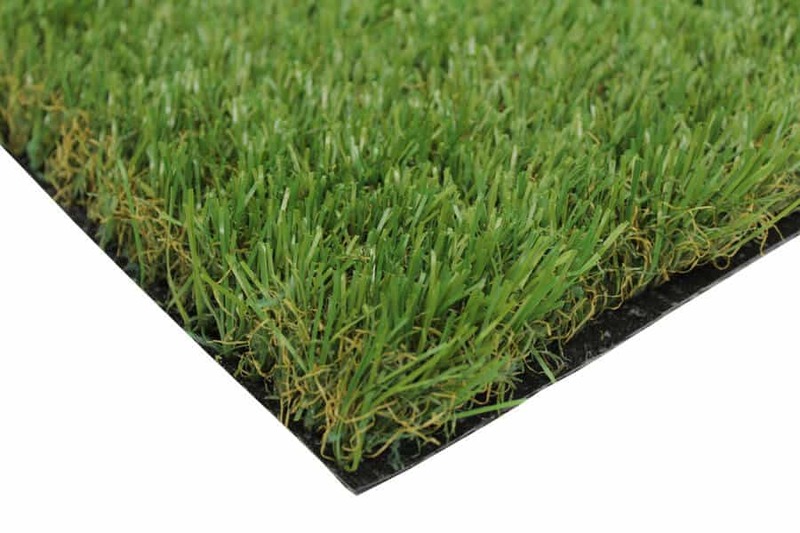 With that in mind, consider an artificial grass product made of polypropylene or polyethylene rather than nylon. These products do not absorb moisture. Nylon does and will keep urine odor trapped inside. Yet, the others don't absorb liquid of any kind. Hence, they will drain more efficiently. Remember, your pet is going to mark territory and pee often on your artificial lawn. When choosing the best artificial grass for them keep the base component in mind. You want to have something that promotes drainage like crushed granite or something similar. Other types of base may trap the moisture ultimately compacting and compounding the issue. This is a big one. You need to consider the proper type of infill for your artificial grass before making a final purchase decision. There are several different types. For instance, you may use copper slag, sand, and crumb rubber just to name a few. The first is much preferable over the other two since it retains less odor. Also, silica sand don't absorb odor either. Yet, you may choose a product like rounded quartz as well. Rounded quartz actually inhibits bacteria and mildew growth. 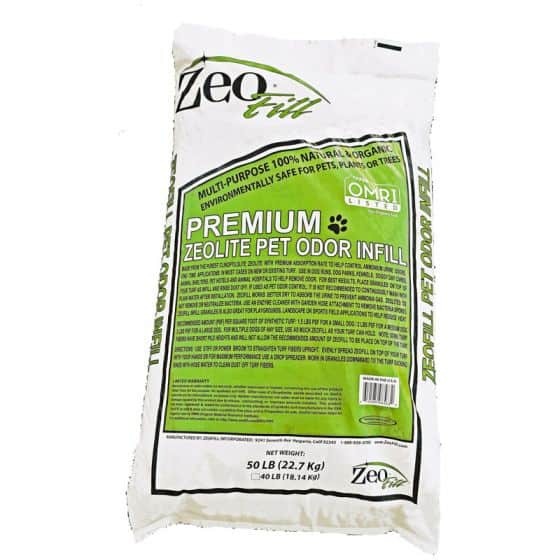 Ultimately, you might try a product like Zeofill. 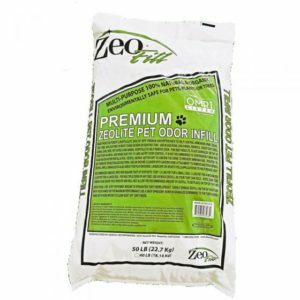 It's the ultimate pet odor barrier that keeps your grass looking and smelling fresh day after day. Just make sure to walk through your choices slowly. Making a poor decision here could negatively affect your lawn for years to come. Finally, be sure to choose a quality product. Experts recommend a turf density of 75 to 90 ounces. The weight and grade of artificial turf should be able to withstand heavy pet traffic. Also, consider the backing material of your artificial grass. It should be nonporous to help retain less odor. Honestly, that's probably something you never would have thought about unless you read it here first. It just goes to show that there are so many factors involved when choosing the best artificial grass for your pet. And we haven't even covered considerations specific to states like California! Artificial grass offers several benefits for pets that regular grass can not. And you may have never thought of them before. For instance, some dogs are allergic to natural grass. Contact with it can make their skin itchy and red. Special creams or medicines may be necessary to remedy the situation. An emergency trip to the vet can be really costly if the allergic reaction goes systemic. Yet, artificial grass is non-allergenic since it is not real. No more itchy days for Fido! Speaking of itchy, there is another way artificial grass helps pets. remember, it is pest free. In order for bugs to thrive, they need an environment that will sustain life. However, artificial grass contains none of those ingredients. Minerals, dirt and other trace elements are not present in artificial grass. Therefore, bugs go elsewhere. So those nasty ticks, fleas, spiders and other biting bugs? They simply move on. Now let's talk about owner benefits. For starters, artificial grass does not promote digging. Therefore, your lawn remains green and lush year round. And, since your dogs are not tempted to dig, there will be no muddy paw prints in your home after a rain storm. Think of all the money you will save with cleaning products. Depending on the size and number of pets you have, it could be substantial. Finally, the last thing to keep in mind is maintenance. Of course, the huge draw of artificial grass is its low maintenance factor. Very little is required to keep it free of dust and debris. However, with pets, maintenance involves just a bit more. This means you will need to spray your lawn more often to keep it smelling fresh. First, remove pet waste when Fido decides to go poo. Second, spray the affected area down with water so it flushes through the artificial grass and drains to the infill below. Doing this as soon as possible after a restroom incident will keep your lawn looking and smelling fresh for years. However, there is one really easy way to handle every aspect. If all of this sounds a bit much, there is a really easy solution. Just call Artificial Grass Pros. We have some of the most experienced installers in the greater Bay Area and are very familiar with artificial grass as it relates to pets. in addition, we will go over options with you and make suggestions regarding infill, product and base application. We know the area best and will be able to match your needs to the perfect product. Remember, we own our own artificial grass manufacturing company. And while you do not have to choose one of our NewGrass products, we can assure you they are top rated. NewGrass carries products featuring the latest technology and innovation. Everything from pristine manicured grasses to something a bit more shaggy and unkempt are available to create a dream space for your pet. Together, we will create an artificial grass lawn your pet will Love. You will too, and your nose will be none the wiser. So don't hesitate. Contact us today and let's get busy transforming your lawn!